A National School was built at Cropwell Bishop in 1850 at the cost of £90 and the money was raised by public subscription. It is still standing and situated on the main street at the north west corner of the churchyard. Children were not obliged to attend this school, for compulsory education was not introduced in England until 1870, and many of the poorer boys and girls went out to work when they were ten to twelve years of age. The Wesleyan – Methodists felt the school should be non-denominational and the number of scholars declined so much that the school was closed between 1875 and 1877. This Anglican School had its setbacks, collecting the fees to maintain the building, and even getting the children to go to school. Child wages were nearly as high as those of adults and attendance fluctuated according to the farming activities. Social life in the village was changing. After the law demanded that every child from the age of five years should attend school, the need for something bigger that the Old Church School became evident. In 1876, a Cropwell Farmer, Vincent Parker who was also Licensee to the Canal Inn, sold for £400 land, house and buildings called the Poplars, to the newly formed Government Educational Department, for the building of a school and school house. At a meeting of the Board on March 25th, 1877, the tender of David Salvin of Cropwell Bishop for building a school and school house for £774 was accepted. The old house and buildings called the Poplars, were cleared away, and the building of the new school house was completed in the year 1878. A young man of only 23 years of age, Mr William Parkin commenced his duties as School Master in September 1878. During the whole time he was Master of the school, he attached much emphasis on his pupils being able to write with a good hand. May of those he taught aquired considerable skill in this art. The impact on village life, many of whom were still illiterate, or nearly so, is hard to imagine. Here at last was a chance for their children to have access to knowledge which up to then had been largely for those who could afford it. William Parkin remained School Master until 1920 when he retired after 46 years service. The school itself consisted of two classrooms, infants and juniors and there were two entrances, one for boys and one for girls, in addition there were also the outdoor toilet facilities. 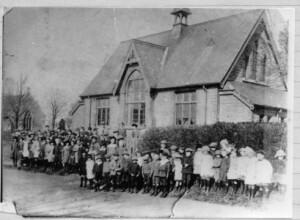 The school was in use until 1961 when the new Cropwell Bishop Primary was built off Stockwell Lane. 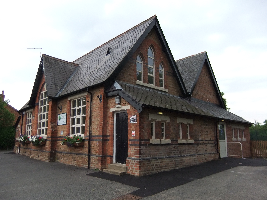 From 1961 onwards the School has been used as a Youth Centre for the young people of the village and has been a valued asset to the community providing a safe environment for the village youth offering them a range of activities. The building and youth provision now coming under the auspices of Nottinghamshire County Council. More recently though in October 2007, the Parish Council became aware that the Youth Service were going to vacate the building with immediate effect, which in fairness was for a number of reasons, primarily that it did not comply with the requirements of the Disability Discrimination Act in terms of accessibility. The Parish Council wrote to the County Land Agent enquiring if it were possible to either rent or lease the premises for use by the Parish, the answer received advised that no decisions were being made at that time. Subsequent enquiries revealed that the site was to be sold off, with the profits from the sale being used to help fund the County Council’s share of the proposed development of the new Community Hub in West Bridgford, a situation which would have deprived the Parishioners of Cropwell Bishop of an amenity at a time when rural communities are fighting hard to hold onto their facilities. The Parish Council gave due regard to the responses in the Parish Plan questionnaire, which stated that 82% of respondents wanted a village building saving if it was under threat. The Parish Council then took the bold and brave step of seeking to purchase the building and the site for the benefit of current and future generations of Cropwell Bishop. The vision for the future of the Old School, were a complete refit and revamp, which would provide Cropwell Bishop with a community hub of its own, with new facilities fit for the 21st Century. The Cropwell Bishop Community Hub now provides activity space for all ages and needs and forms the new base for the Parish Council and the extended services it provides. We have regular meetings and events each week and an Entertainment Committee who provide bespoke events for the community. The fantastic facility is available to hire for business meetings, group events, clubs, birthday parties, weddings – you name it we can host it. We have a range of bespoke children’s birthday party packages we can offer and we are also fully licensed. Please see the What’s On Publication in this section for weekly events and if you want to hire the old school for a regular weekly group of any kind please contact the Parish Clerk – Janice Towndrow on 0115 9894656 and she will do her very best to accommodate you.